Alternate reality sci-fi noir. That phrase alone is enough to catch my attention and pique my interest. It also happens to be the set up for Van Alan’s new series Automata. Check out the new trailer below. I'm so down with this. Though there are certain thematic similarities, this Automata should not be confused with Gabe Ibanez’ 2014 sci-fi thriller of the same name. They’re two very different beasts. Based on a Penny Arcade comic of the same name, Automata has a cool hook: in an alternate version of Prohibition-era America, instead of alcohol being banned, the government bans production of sentient robots called “automatons.” So we’ve got robots and dudes running around in fedoras and dusters and seedy criminal underbellies. That sounds like a fine time to me. It also gets bonus points for being filmed in Washington, which is near and dear to my heart. 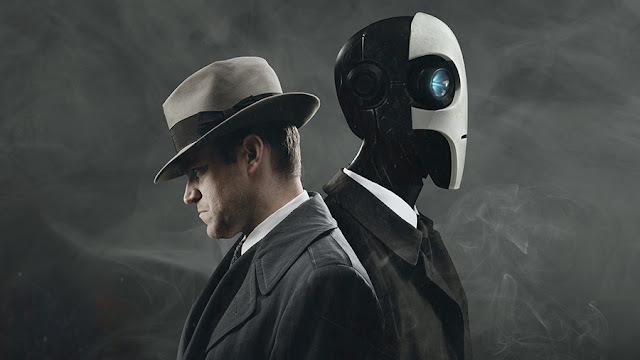 This trailer doesn’t tell us too much about the nuts and bolts of Automata, but sets the stage and give us a good idea of what to expect mood wise, tonally, and the overall aesthetic. It has a distinct vibe, the robots have a spiffy look, and I’m certainly down for this kind of genre mashup. Set in an alternate Prohibition-era America, this live action science-fiction noir series based on characters from the popular web-comic by Penny Arcade invites you in to experience a world unlike anything you have seen. In this fictional 1930s, it is not liquor that is outlawed but instead the continued production of highly sentient robots known as automatons. They live among us as an underclass of social outcasts, victims of human prejudice and strict laws that govern their existence. Automata follows New York private detective Sam Regal (Basil Harris, NBC's Grimm, TNT's Leverage) and his automaton partner Carl Swangee (Doug Jones, CBS's Star Trek: Discovery, Pan's Labyrinth, Hellboy/i>) as they work together to solve the crime and understand each other in this dystopian America. We’ll see what comes of this, but as it stands, Automata definitely paints an intriguing picture. There’s plenty of room for hard-boiled detective tales with a cool sci-fi edge, not to mention potential to use genre trappings to root around in deep thematic territory. I’m going to give this a whirl when we get the chance. Automata debuted its pilot episode last night at Series Fest in Denver, with another showing scheduled for July 1. We’ll have to wait and see how it all shakes out, but I definitely have my eye on this and can't wait for the five-episode series to drop.